(Nanowerk News) At nuclear power plants and legacy waste sites, a particularly difficult-to-capture hazard is radioactive organic iodides. These compounds are made of hydrocarbons and iodine. In this work, scientists modified cage-like molecules called metal-organic frameworks (MOF). They added small “hooks” inside the cages. 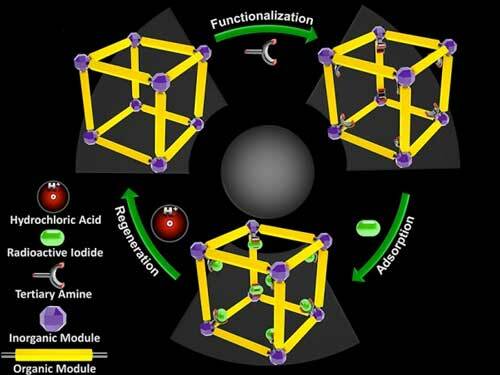 The modified MOFs were more than three times more effective at capturing radioactive organic iodides than the leading materials used by the U.S. nuclear fuel industry. Also, these traps were recyclable, unlike other adsorbents (Nature Communications, "Capture of organic iodides from nuclear waste by metal-organic framework-based molecular traps"). The modified MOF has a high capture capacity, stability, recyclability, and low cost. It holds promise for effective capture of a difficult byproduct from nuclear reactors. Further, this study revealed that through chemical modification, MOFs could be tuned to capture specific molecules. Molecular tuning of MOFs has potential, broad impact in the chemical industry. Since the 1980s, research has focused on containment of radioactive iodine, associated with nuclear energy and legacy environmental sites, because it is long-lived and can be incorporated into the human body, where it is linked with cancer. Radioactive organic iodide is particularly difficult to capture and sequester and thus tends to more easily leak into the environment. Effective capture of radioactive organic iodides (such as methyl iodide) remains a significant challenge due to the drawbacks of currently used adsorbents. These drawbacks include low uptake capacity, high cost, and non-recyclability. This work demonstrates a general approach to address this challenge by creating molecular traps through chemical modification of metal-organic framework (MOF) materials. Binding sites (chemical “hooks”) are added to this highly porous, high surface area material. The binding sites have reactive nitrogen that can bind to the organic iodides. The trap exhibited a high methyl iodide capacity—over three times higher than the currently used industrial adsorbent under identical conditions. Also, these new MOFs advantageously serve as good adsorbents at lower temperatures. Furthermore, the MOF adsorbent can be recycled multiple times without loss of capacity, unlike other known industrial adsorbents. The team investigated the capture mechanism by experimental and theoretical methods. Their work verified that binding is occurring at the “hook” sites in the MOF. Due to its chemical and thermal stability, high capture efficiency, and low cost, the new MOF adsorbent demonstrates promise for industrial radioactive organic iodine capture from nuclear energy or treatment of legacy environmental clean-up sites.